First Direct is set to charge its customers for running a current account unless they pay in or keep a balance of at least £1,500 a month. It is proposing to charge people who only have a current account a £10 monthly fee, potentially affecting up to 195,000 customers. The fee will be waived if customers open a savings account or buy products such as home insurance or loans. The bank said the move was aimed at dormant or rarely used accounts. About 40,000 of its basic accounts are not used at all while a further 250,000 accounts see fewer than 10 transactions a month. The new charging structure, part of an overhaul of fees for accounts and overdrafts, will come into effect in February. First Direct, the UK telephone and internet banking arm of HSBC, will write to all its 1.3 million customers to let them know how they can avoid the £10 charge. The fee will apply to those paying less than £1,500 into their account each month or those who have an average monthly balance below £1,500. "I want to focus our efforts on our most important customers: those who use us as their main bank or who have a number of products with us," said Chris Pilling, First Direct's chief executive. "Many of our customers do not enjoy the full benefits as they use us for a secondary account." 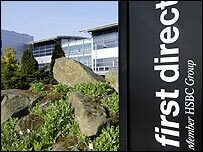 First Direct said it believed 85% of its customers would be unaffected by the charges. "Some customers are more important than others because those customers who have the deepest relationship with us, benefit from the offer we have got," Mr Pilling said. Mark Gander of the campaigning website Consumer Action Group said First Direct's move was the first step towards the end of free banking in the UK. "This is an example of banks putting their toe in the water of ending free banking," he told the BBC. "First Direct is a small bank and maybe it's a sacrificial lamb to put out there to see what's going to happen."